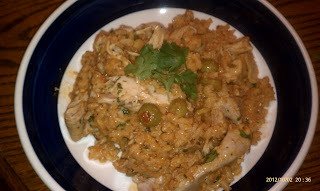 Fringes of His Ways: Arroz Con Pollo! Okay, I am just going to get this out of the way. Why call it arroz con pollo? It's chicken and rice, right? So why not just call it chicken and rice? Even Latin-style chicken and rice? Because we don't eat long strands of noodles with tomato sauce. We eat spaghetti. Spaghetti isn't an English word. It is used commonly to describe an Italian dish. So why should arroz con pollo be any different? Chicken and rice is a broad category of dishes (just check the back of any Campbell's Soup can), not a particular dish. Arroz con pollo narrows it down. We are definitely not talking about creamy mushroom sauce, here. 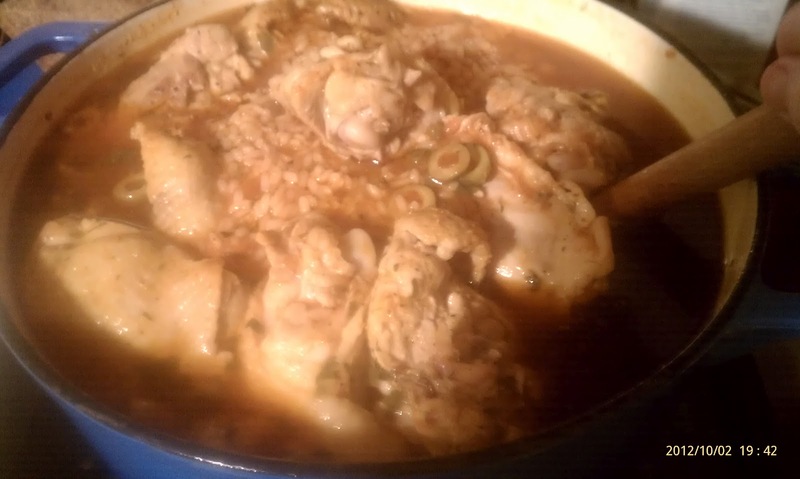 Still, arroz con pollo isn't completely specific. There are many versions of it, just as there are many versions of spaghetti. In fact, I started craving this dish last Sunday, when I saw it on the menu at a Mexican restaurant. It didn't look nearly as good as this dish, though. This is comfort food. Not too spicy, not too refined. But good. Really good. And just interesting enough to set it apart from the rest. This recipe is adapted from one that I found in Cook's Illustrated magazine. The good folks at Cook's Illustrated are always reliable. When you are looking for the ideal version of any dish, this magazine is a good place to start. However, I have made a few changes due to personal preference, experience (my rice dried out too much when cooked according to the original directions) and convenience. Yes, sometimes I think the professional cooks (while amazing) fail to appreciate the fact that dinner prep usually coincides with supervising kids' homework and chores, breaking up arguments, and answering all the questions that have been saved up all day while they were away at school. So if I can streamline a bit, I most certainly will. That said, this is not a quick weeknight recipe. It is a bit time consuming. Not difficult, just time consuming. I hesitated to post this as the first recipe on this blog, but it is just so good and so enjoyable to make that I couldn't resist. So either try it on the weekend or start it when you have some time earlier in the afternoon. Getting prep work out of the way early is always helpful. 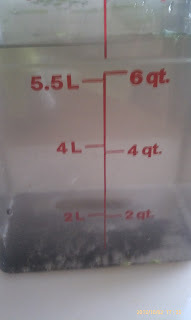 Also, this makes a big batch! Of course you can cut this recipe in half or even less. We love having lots of leftovers for lunches and even dinners later in the week. 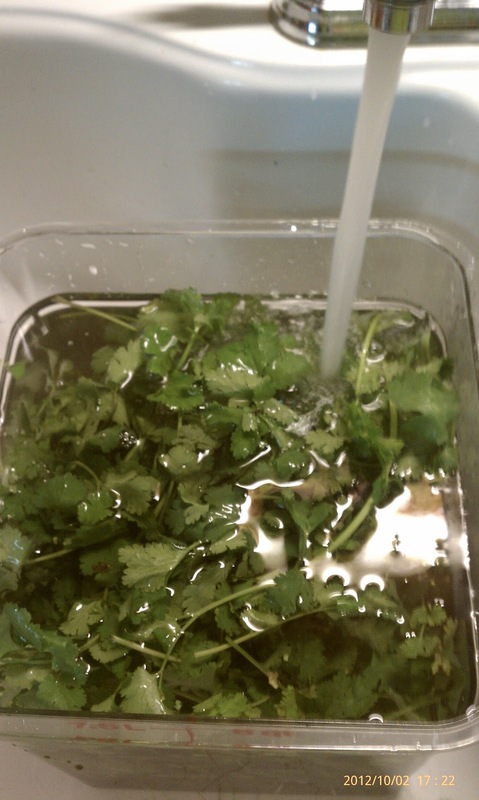 Now, you will usually get fairly clean cilantro (and other fresh herbs, by the way), and you may go through several buckets of pretty clean water and think, "Oh, a quick rinse will do just fine." Don't do it. Because sometimes the little clumps of dirt hide, and they can easily ruin a meal of Tequila Lime Shrimp and Rice. Not that I know this from experience, mind you. Okay, so put your cilantro into a large bowl of water and swish it around with your hand, then leave it alone for a few minutes. 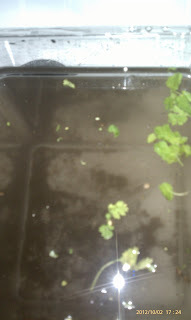 Any sand or dirt will fall to the bottom of the bucket, and you can carefully lift the cilantro (which will be floating on top) out of the water without disturbing the dirt. 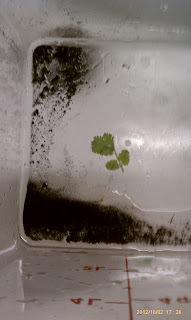 Since my cilantro had so much dirt, I didn't trust that there wasn't still some floating around. I emptied and cleaned the bucket and did the whole process again with clean water. The second time, I could see that the water was still pretty clear, and there was very little sediment on the bottom of the bucket, so I let the cilantro sit in the clean water while I prepped the rest of the meal. 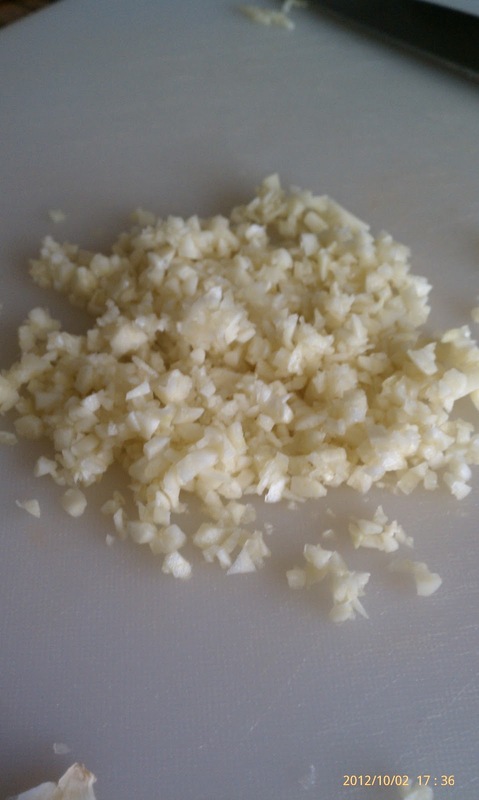 Mince up six cloves of garlic. 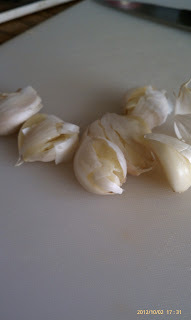 After peeling the skin off, just slice each clove thinly (don't be too fussy), and then pile up the slices. Hold your knife firmly by the handle with your dominant hand, and place the tip on the board at the other side of your pile. Now place your non-dominant hand on the dull (top) side of the knife, and place light pressure with your palm. Keep your fingers up and out of the way! 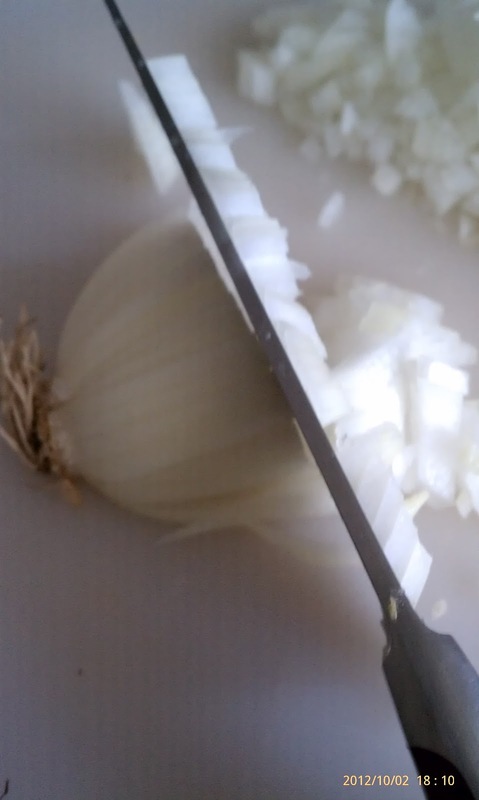 Now rock the knife up and down, side to side, as quickly as you feel comfortable, over the pile of garlic slices. Occasionally, you will need to wipe off the sides of your knife. Before long, your slices will turn into tiny minced pieces. 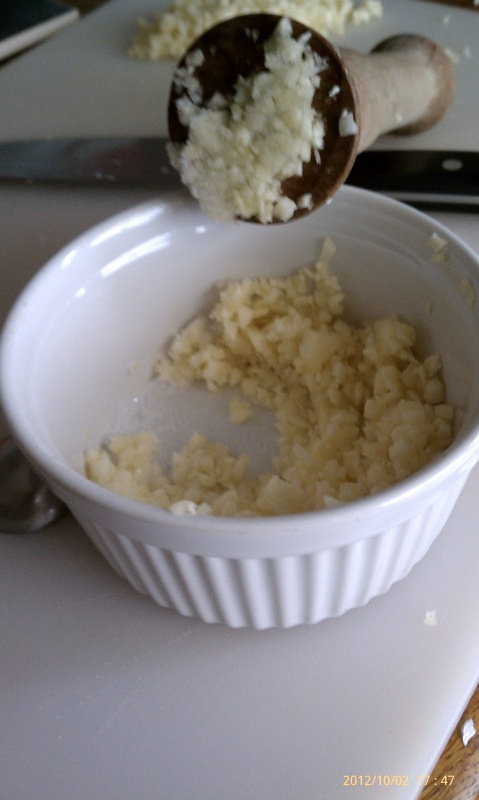 Throw all of the garlic into a bowl. You should have about 2 tablespoons (more is fine). 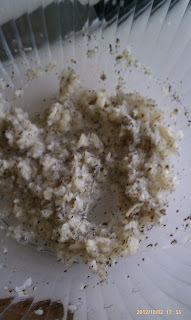 Add a teaspoon of table salt (not course, in this case) and mash it up into a rough paste. Cook's Illustrated suggested using a rubber spatula. I had no luck with this option. I've seen chefs use the flat of their knife to smash the salt and garlic into a paste, but I have little counter space, and my cutting board tends to become quite crowded, so that wasn't a great option for me, either. 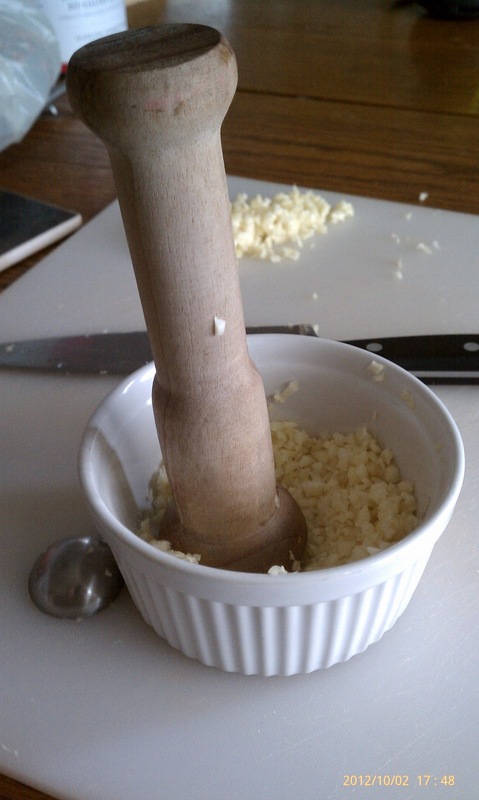 So I thought I would replicate a mortar and pestle. I just used a small ramekin (any bowl would work) and a wooden mini tart shaper. This is as close to MacGyver as I get. 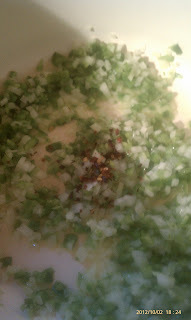 Now put the garlic paste into a larger bowl (unless you are smart enough to start with the larger bowl, thus saving yourself a dish to wash), and add some vinegar, oregano and black pepper. That's the marinade. There's not a lot, so you aren't going to soak the chicken in it so much as coat the chicken with it. This recipe uses chicken thighs. You can, of course, use chicken breasts. 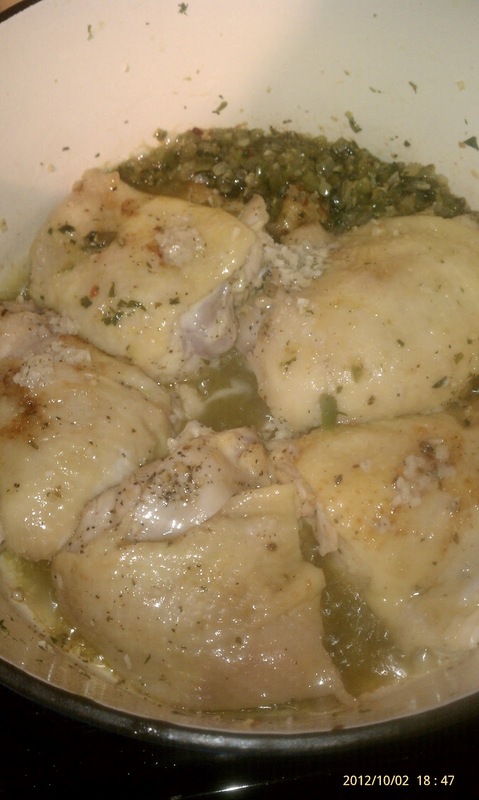 However, since the chicken simmers in liquid for most of the cooking time, chicken breasts create three problems. First of all, there is not a lot of bone structure in a chicken breast. Pretty much just a few ribs. As gross as it sounds, most of the flavor in broth comes from the bones and fat of a piece of meat. And that's the second problem. Breasts have very little fat. That's a great thing if you are just eating the meat. Not so great if you are trying to extract flavor for the rest of the dish. And finally, white meat simmered in liquid tends to become dry and stringy. I know that doesn't make much sense....it's in liquid, and that causes it to dry out. Never the less, it is true. The end result is a stringy, dry and overly chewy meat that I just don't care for. However, if you are happy to sacrifice the texture of the meat and the flavor of the dish in order to cut the fat, you certainly can do so and still have a good meal. I like a compromise. I use thighs, but I trim them well. The first time I made this dish, I did not trim them much, and I was sorry. 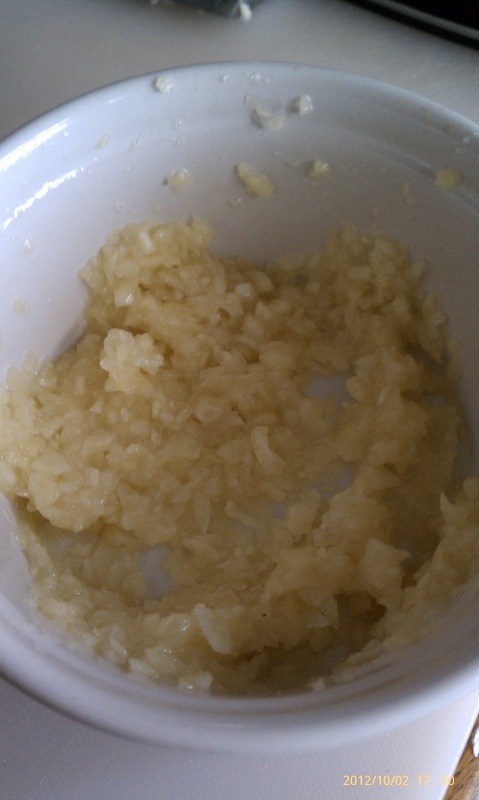 The rice had a greasy mouth feel that was very unpleasant. 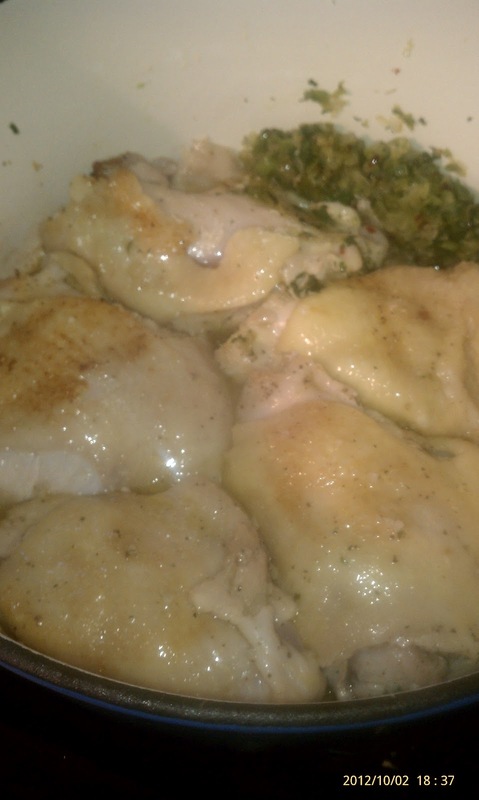 To avoid this, but still end up with a lot of flavor, I trim about half of the skin off from each thigh. 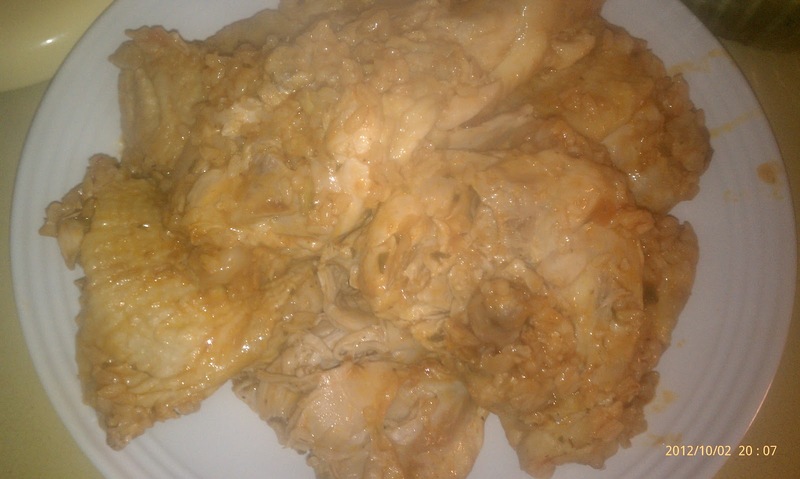 You'll notice that most chicken thighs come with a large flap of skin that wraps around the underside of the thigh. I guess if you like skin.....but I don't. So I use kitchen shears to cut that flap, along with any fat that is attached to it, off of the thigh, leaving only the top side of the thigh covered with skin. It makes an enormous difference. And if working with raw chicken grosses you out, the good news is that you can do this without ever touching the chicken! Use a good pair of spring loaded tongs to lift the chicken away from the package. Set it down on a plate or cutting board, and then lift the flap of skin with the tongs, and use your other hand to cut it off. You can use the tongs to toss the chicken with the marinade, too, but I prefer to get my hands in there and really massage the stuff into the chicken. And then I wash my hands VERY WELL. I'm kind of a freak about washing chickeny hands. 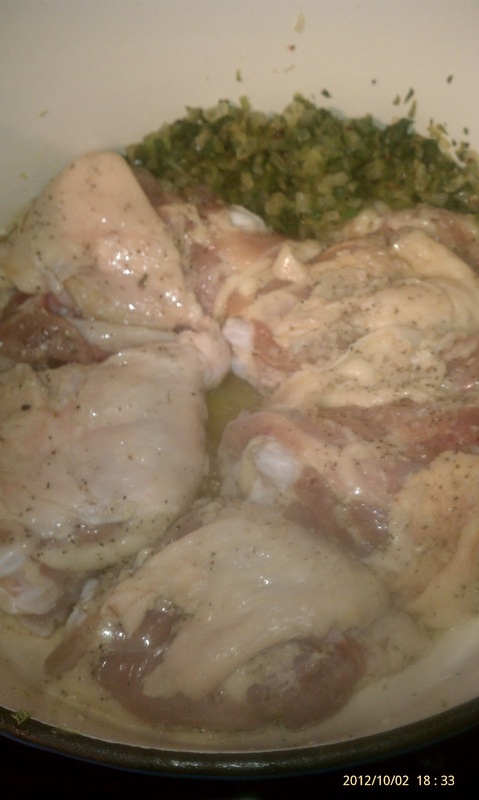 Now you can set the chicken aside for about 15 minutes while you cook the onions and peppers. Okay, so everyone has seen the way that the t.v. 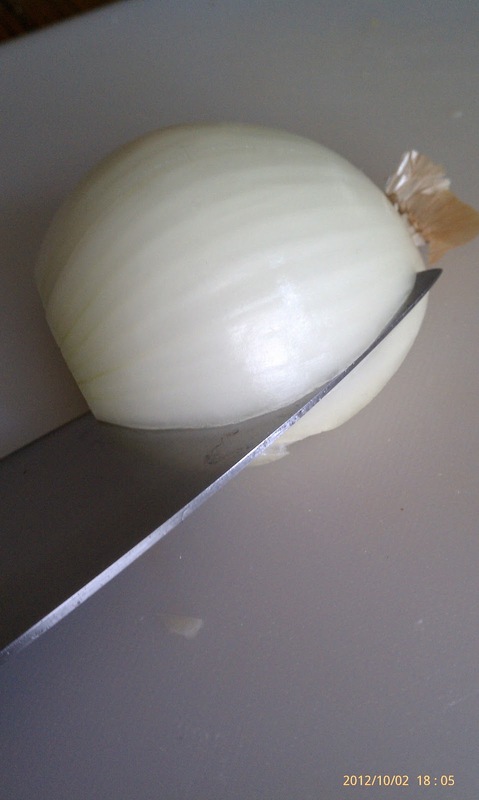 chefs chop an onion, right? Cut off the tip, peel it, and slice it in half , through the intact root. I do that, too. After that, though, I differ. Most of them make vertical slices from side to side, across each half of the onion. 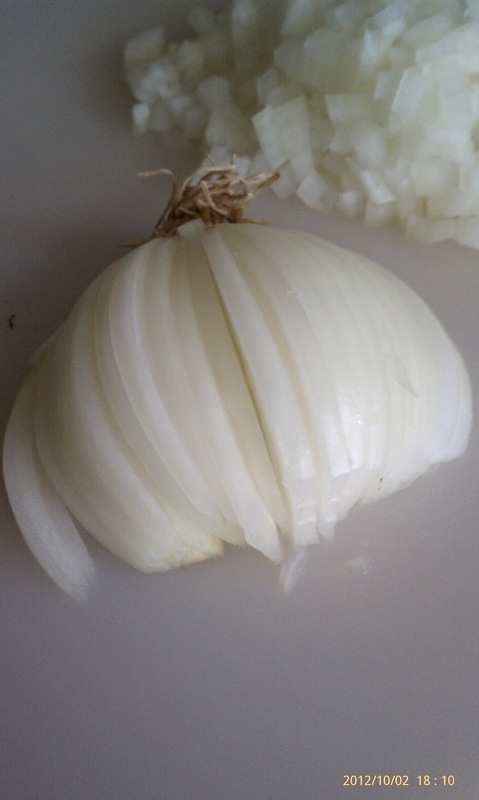 Then they make vertical slices from the tip to the root end of the onion, basically making a checkerboard pattern if you look at it from the tip end. The problem with this is twofold. 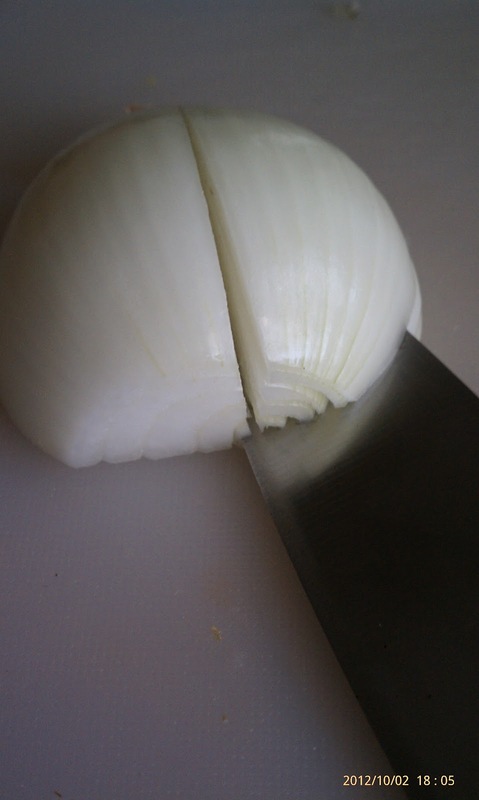 First, the onion is round, not square, so a checkerboard will result in a wedge around the curve of the onion on each side, which, when sliced, gives you larger pieces than the rest. This bugs me. 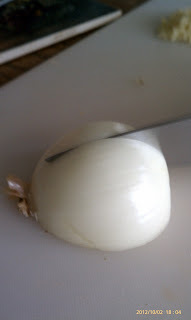 Also, slicing into the onion horizontally from the cut tip end basically pushes the onion, making it difficult, if not dangerous to make those cuts with any but the sharpest knife. Because it is more difficult, it becomes almost impossible to achieve a fine dice. I learned my technique from Alton Brown, though it was many years ago, so I might have changed a few things over the years. 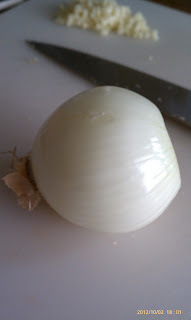 First, I make one vertical slice down the center of the onion half, from the tip, almost to the root, though you want to leave the root intact until the very end. Then I make several angled cuts, starting on the far side. I start at the base of the knife, and gently pull the knife as it slices inward, aiming for the base of that first center cut, just missing the root with the tip of my knife. And continue until I have many wedges, of any thickness that I desire (in this case, quite fine), still attached by the root. And finally, I slice across those wedges, again, as thickly as I like. 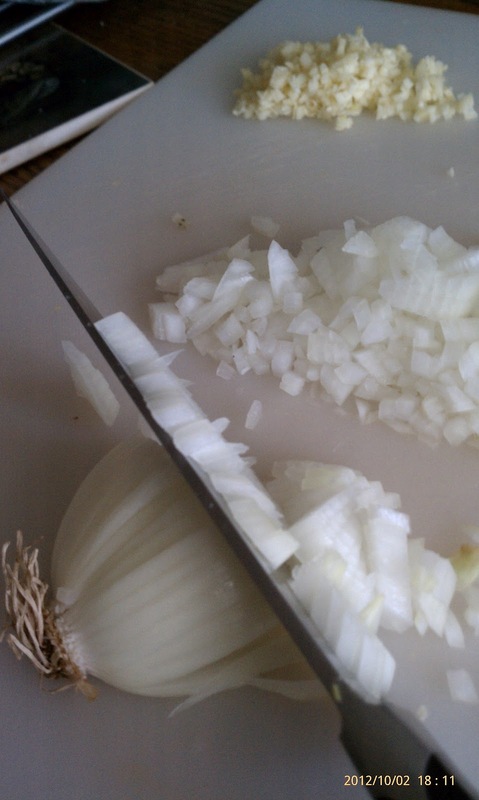 If you want to make strips of onion for fajitas or onion soup, you can just cut the root off and leave the wedges long. Because the onion consists of petals, the individual pieces fall apart and you have easy minced onion. This may sound complicated, but it really isn't. It takes a few minutes of practice, and you have it. As silly as it sounds, this may have been the one skill that made me really enjoy cooking. 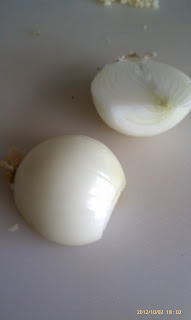 I use onion in practically everything, and I always found it to be so difficult to dice. Having a good knife and knowing how to make the onion behave has turned a pain in the neck step into one that I barely need to think about. And this has been....Knife Skills with Katy. Enough of that. On with the recipe! 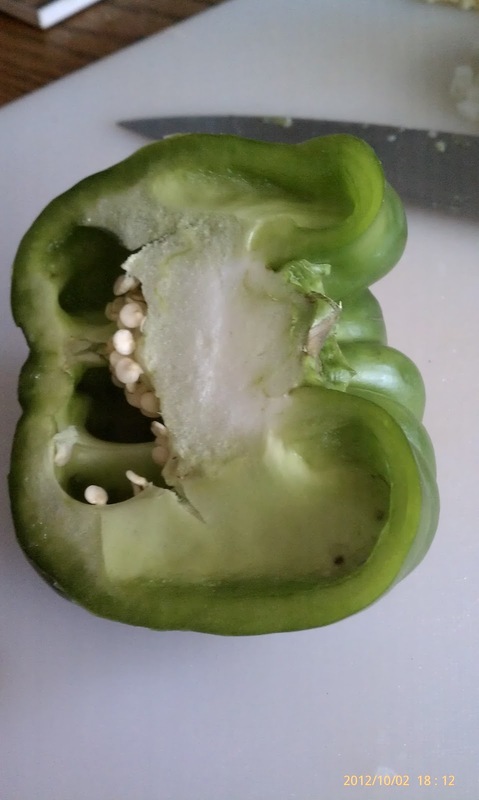 Finely dice a small green pepper, or half of a large one. Remove the seeds, cut it into strips, line the strips up, and cut across to make a dice. Heat up a tablespoon of oil in a large Dutch oven until it shimmers. You'll know it when you see it. And if you see smoke....then I was wrong and you missed the shimmer. 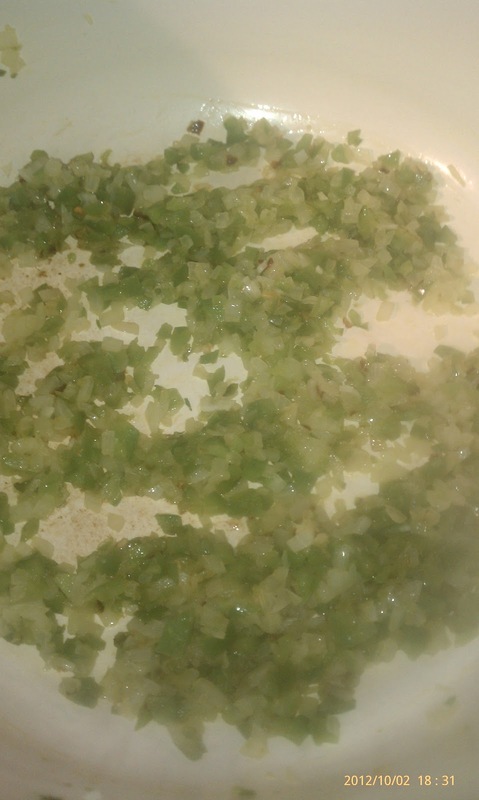 Throw in the onion and green pepper, along with some red pepper flakes, and cook over medium heat, stirring occasionally, until softened. This is about as soft as you want them. We're not going for brown here, so don't worry if they seem to be steaming. It only takes about 4-5 minutes. 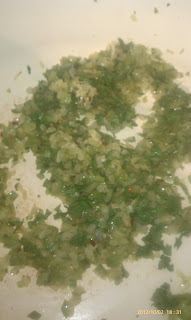 Then toss in a couple of tablespoons of minced cilantro leaves and toss them around with the veggies for a minute or so. Then push them to the side of the pot. If you have a hot spot and a cool spot on your stove, push them to the cool side. If you're not sure, think about when you brown meat. Does one side seem to brown or even start to blacken before the other side has lost the pink? That's a hot spot. If you have a better stove than I have and you don't get hot spots, bless your heart. Push your veggies to the perimeter of the pot and add a tablespoon of olive oil to the pot. Now place half of the marinated chicken thighs, skin side down, onto the oil. Don't worry about hearing the blessed sizzling noise that tells you that the pot was hot enough. We are not searing this meat. We aren't even browning it. We are just cooking it for 2-4 minutes, or until the meat starts to look opaque. If it starts to brown, turn the heat down a bit. Did you notice that my picture doesn't show the thighs skin side down? Well, actually it does. Remember that whole schpiel about trimming the skin flap? I forgot until precisely the moment that this picture was taken, to trim the skin. At least I remembered before ALL the chicken was in the pan. Now turn the chicken over. This is all the brown we want to see. See the slight difference in color? Don't worry....there's plenty of time for the chicken to finish cooking. When the second side is slightly opaque, remove the thighs to a plate and stir the veggies around to make sure that the ones on the bottom don't stick. 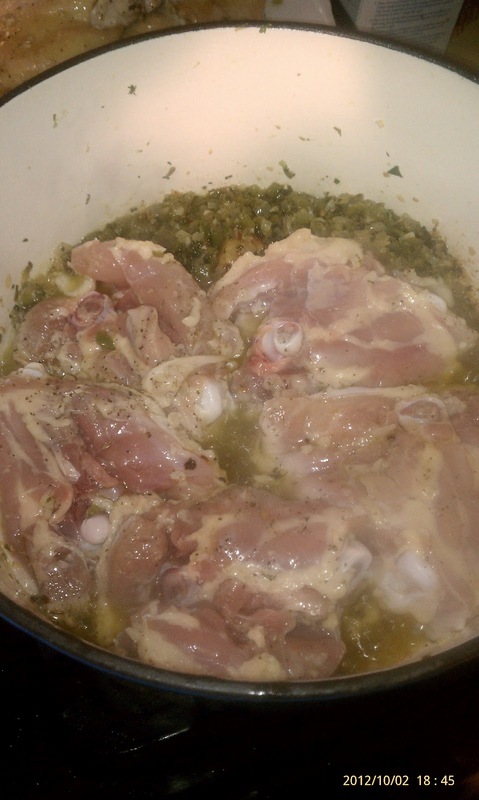 Now repeat the process with the second batch of chicken. See? I remembered to trim the second batch. 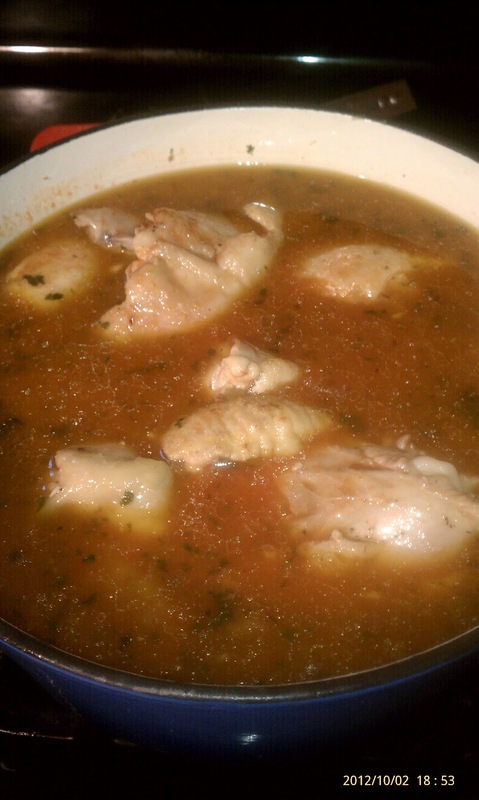 Now add some canned tomato sauce and low sodium chicken broth. 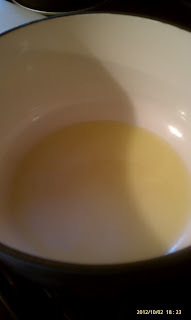 Stir it around, then increase the heat to high and bring the liquid up to a simmer. Reduce the heat again to medium (you don't want it to boil) and cover the pot. You can pretty much leave it alone for a good 20 minutes or so, but don't go too far until you are sure that the contained heat from the addition of the cover won't make it boil over. Adjust the heat as necessary. At this point, you can preheat the oven to 350 degrees. 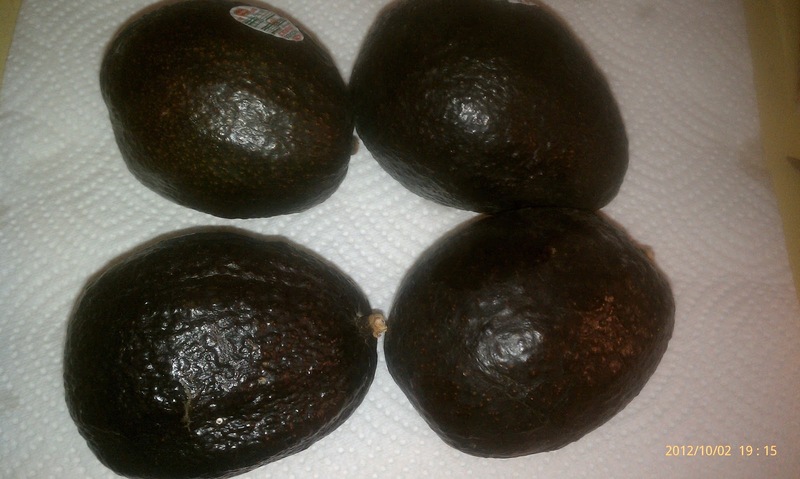 Meanwhile, you can make some guacamole if you have some avocados lying around that are ripe, and perhaps will be overripe if you put off using them one more day. I'll post that recipe later. After 20 minutes of simmering, remove the top and pour in some rice and sliced green (Manzanilla) olives, with pimento. Here's where I almost didn't give the recipe a try. And I like olives. On a relish tray at holiday dinners. Or on pizza. But cooked into a chicken and rice mixture??? Well, I am glad I have a policy of trying a recipe as written at least once before I start changing things. The olives really add to the flavor of the complete dish. And they lose some of their pungency as the briny flavor melts into the sauce. It really all works together beautifully. Try it! Give it a good stir to distribute the rice around the chicken. Put the top back on and place the pot into the oven. Set the timer for 10 minutes. In the meantime, mince up some more cilantro. I am not sure if such a thing as "too much cilantro" exists. But use at least 1/4 cup of leaves. Throw the minced cilantro into a medium bowl, add some white vinegar and olive oil. Set aside. 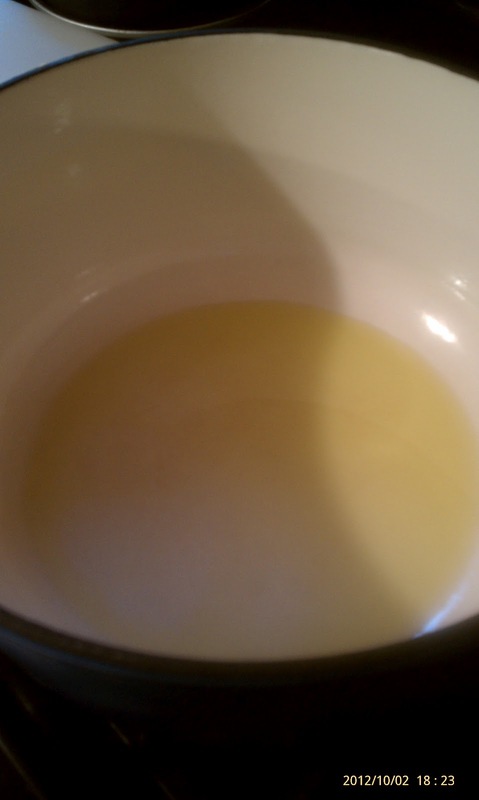 After 10 minutes, remove the pot from the oven and give it a big stir from the bottom. I like to use a sturdy silicone spatula (like rubber spatulas, but heat resistant) and scrape the bottom as I lift and stir. This ensures that the rice doesn't just stick to the bottom and burn. Place the top back on, and pop it back into the oven for another 10 minutes. "Pop" may be the wrong choice of word, given the weight of this very full pot, but you get the idea. 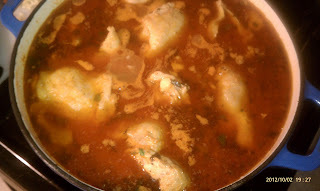 At this point, remove the pot again and check the temperature of the chicken. 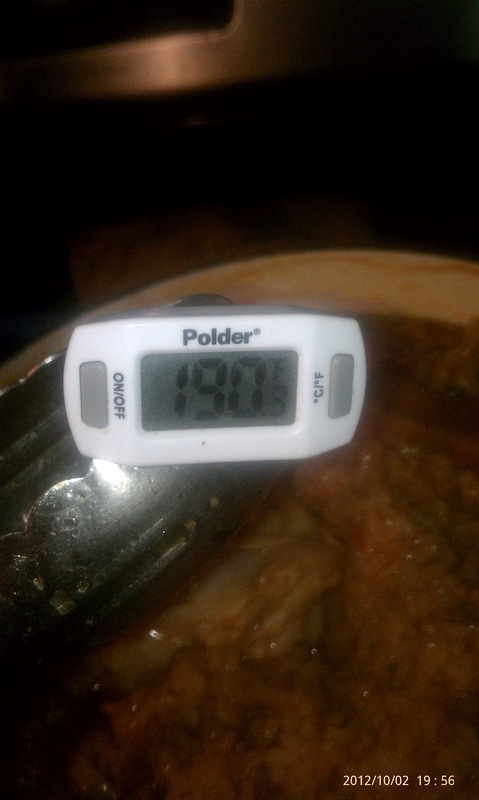 An instant read thermometer inserted into the thickest part of the meat (not touching bone) should register at least 175. I was well into the safe zone. However, you don't really have to worry about it being overcooked, because it's a gentle heat, not dry or direct like a roasted or grilled bird. If your chicken is not cooked to 175 degrees but this point, or if your rice is not tender, give it another bottom to top stir and go another round in the oven. 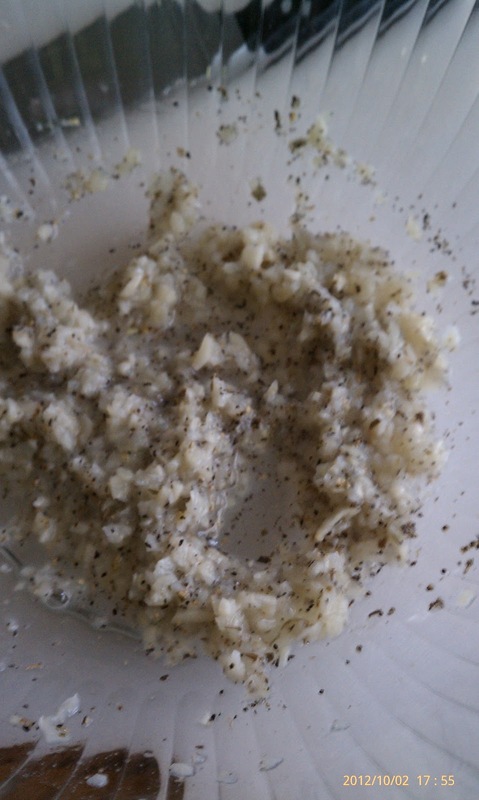 If the rice looks dry, though....add 1/4 cup of water before placing it back in the oven. Don't remove the chicken early, because rice will stick to it, and if the rice is still crunchy....well, that's a problem. Alright, almost there. The kitchen (actually, the whole house) smells wonderful, and you are starving. Be patient, grasshopper. One more step is necessary for this dish to go from delicious to fantastic. First, go on a treasure hunt with your tongs and fish all the chicken pieces out of the rice. Put the cover back on the rice to keep it warm. Again, using tongs, lift the remaining skin off of each thigh and discard. Now, you can either wait until it is cool enough to handle and use your fingers (messy), or use two spoons to pull the meat off of the bone into large chunks. By the time you get through all the thighs with the spoons, the first thigh will be cool enough to go back and use your fingers to pick off any remaining meat, if you so choose. 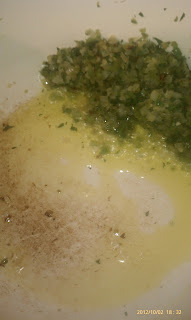 Remember the cilantro/vinegar/oil mixture that you put together a few minutes ago? This is the time to use it. 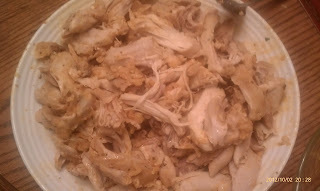 Put all the meat into the bowl and toss it around, adding salt and pepper to taste. I know it sounds weird, but it does not come out tasting like vinegar. Actually, it adds a fresh hit in a dish that could otherwise come out tasting kind of heavy and....well, cooked. Does that make sense? Think of the difference between freshly made salsa and salsa that has been canned. Both are good, but the fresh flavors of the uncooked salsa are brighter, fresher. That is what the vinegar and extra cilantro do for this arroz con pollo. Now put all of the meat into the pot and stir it into the rice. If you want even more of a fresh, clean zing, spray a wedge of lemon on each serving. There you have it. Your patience has run out just in time. Trust me on this one. Enjoy!